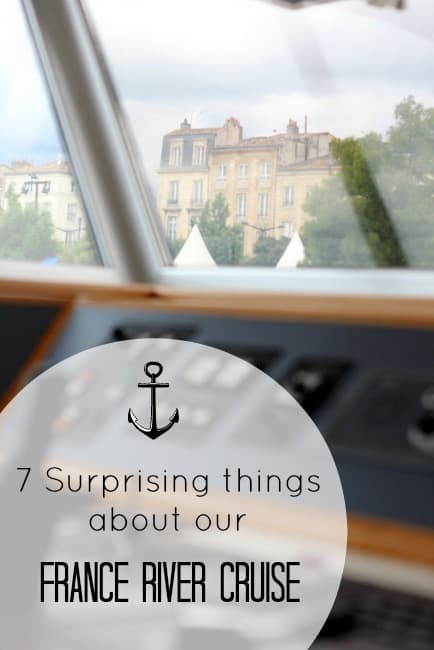 Tom and I recently spent a long weekend cruising on the Seine from Paris to Normandy aboard CroisiEurope’s MS Seine Princess, and there’s something about seeing a place from the water that’s really special. 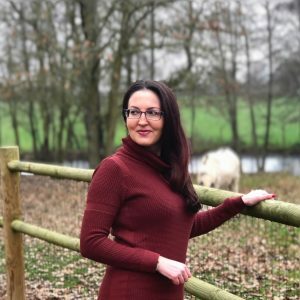 If you’re new to river cruising or have never considered it before, let me fill you in on this one-of-a-kind experience. 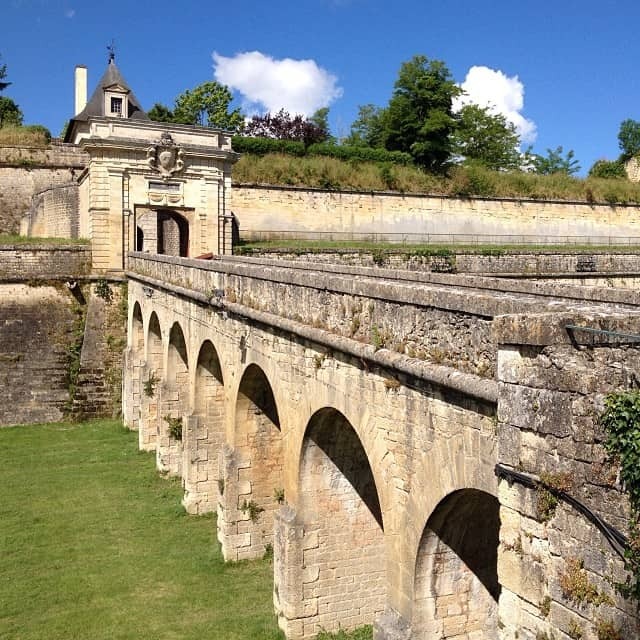 A France rive cruise is so much more than a hotel on the water! River cruising has become hugely popular in recent years in Europe and for good reason. Prices have become more reasonable and people are catching on to their appeal. With itineraries all over France and for a variety of lengths, a France river cruise offers a fantastic, stress-free way for the francophiles among us to discover France from a new vantage point. Food and drink are generally included and excursions are top-notch ways to learn about the areas you visit. 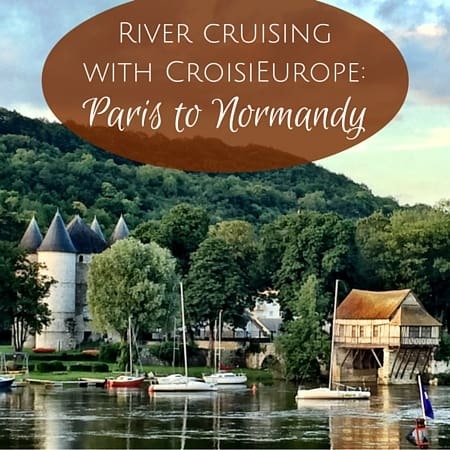 One particularly accessible cruise for anyone visiting Paris is the 5-day CroisiEurope cruise from Paris to Honfleur in the Normandy region of France. Tom and I thoroughly enjoyed ourselves! 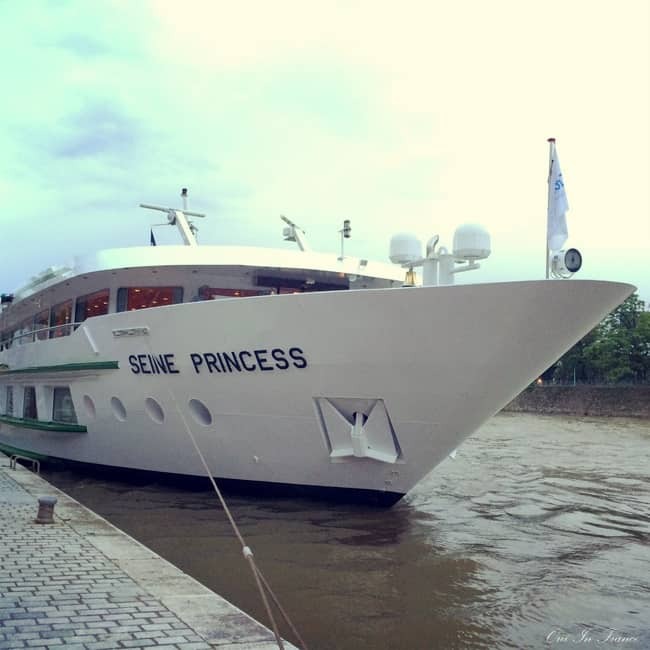 We boarded the Seine Princess around 5 p.m. on Friday, cruised for the next couple of days throughout the Paris region, up to Rouen and later arrived in Honfleur — 350 kilometers of cruising later. The trip ended Tuesday morning at 9 a.m. when we disembarked. It flew by! 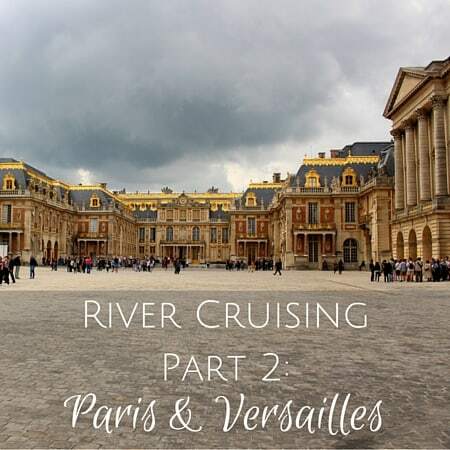 Here’s an overview of our France river cruise. Please stay tuned for more about our river cruise experience in the coming weeks! 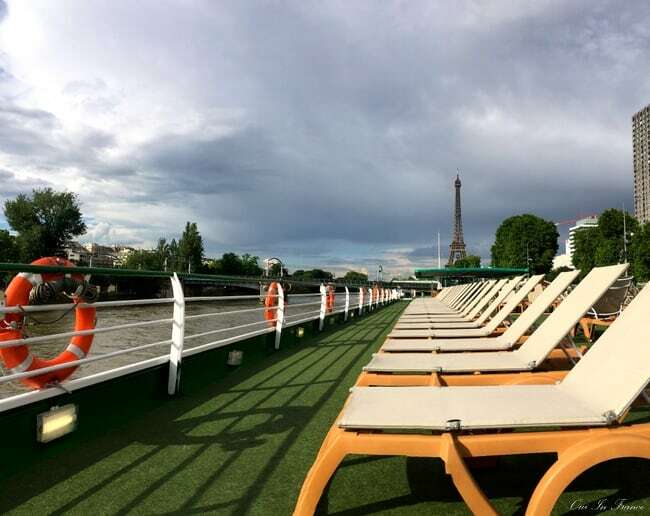 Day 1: Boarded the Seine Princess on Quai Branly in Paris around 5 p.m. The crew was introduced during the welcome cocktail and then we headed to the dining room for dinner. Normally there’s a night cruise along the Seine but we stayed docked due to high water levels that unfortunately didn’t allow us to safely pass under the bridges. Overnight stop in Paris. Day 2: Departed Paris early and headed toward La Defense and then docked in Poissy. We got off the boat and went on the excursion to see the Palace of Versailles including a tour of the gardens as well as inside the chateau. While out for the day, the boat continued along the Seine and docked at Mantes La Jolie, where we reboarded after our tour. The ship left in the afternoon toward Vernon where we spent the night. Day 3: The ship leaves and heads toward Rouen. We take the optional walking tour of the city with a guide and then decide to explore a little on our own. Gala dinner on board. Day 4: The ship leaves at 4 a.m. toward Honfleur and we arrive around 10 a.m. Optional walking tour of the city. Once the rain stopped, we headed out on our own to discover Honfleur. Day 5: France river cruise is over and passengers disembark at 9 a.m.
CroisiEurope is the biggest river cruise carrier in Europe and extremely popular with Europeans. A family-run business founded by Gérard Schmitter in 1976 and headquartered in Strasbourg, France, CroisiEurope has a fleet of 50 ships that cruise Europe’s rivers in France, Italy, Spain, Germany and Belgium. In 2012, the company created an English-language website and since then, there has been a surge of anglophone guests from across the Channel and Atlantic. Most of the ships can accommodate between 100 and 200 guests making the experience intimate with great service but with enough space to still do your own thing. English and French are spoken on board (as well as any other languages needed to communicate with passengers). Before going on a river cruise myself, I wasn’t familiar with the concept and thought maybe they were day cruises. That’s not the case! The ship acts as your home base and that’s where you sleep, eat and hang out. It’s more or less like a fancy hotel that moves you down the river. 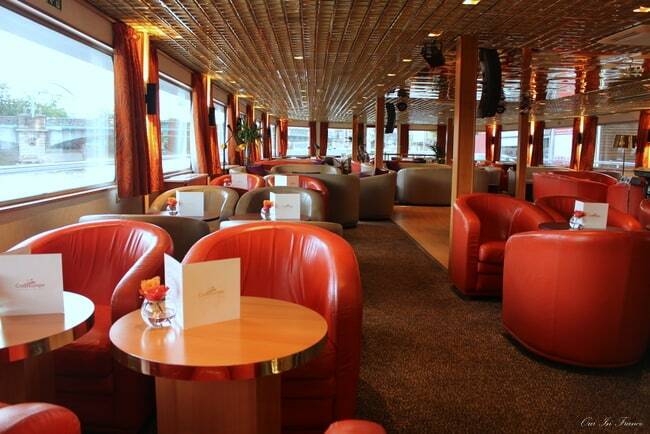 On CroisiEurope, there’s free Wi-Fi in the lounge. Meals are included in the price of the cruise as well as all wine, soft drinks and other beverages. The vantage point from the river is spectacular and I highly recommend CroisiEurope as an affordable river cruise option to see the Seine. 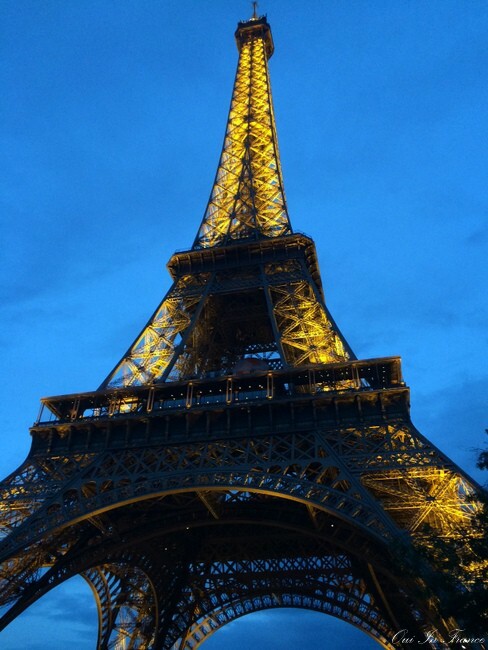 What’s up next on our France rive cruise? The destinations, a look at the food and more. Stay tuned! 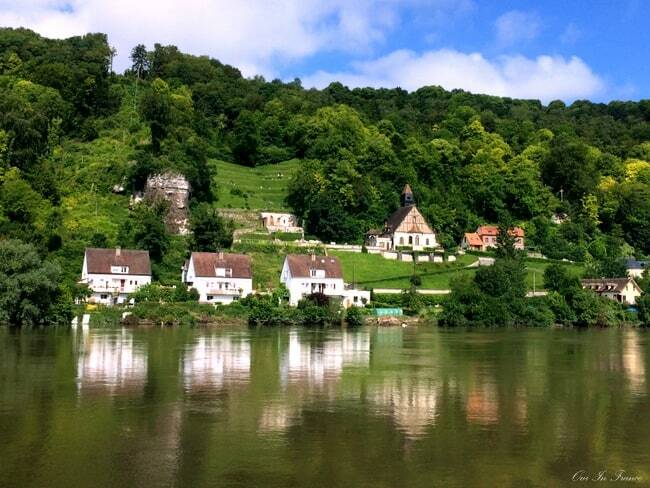 Have you ever gone on a France river cruise? Is it something you’d be interested in? Cruises on the ocean don’t appeal to me–I don’t like being on the water and my idea of a vacation isn’t lying in the sun but going to museums and seeing different cultures. I’ve done short river cruises, but not yet a long one. This looks really nice, and you have a lot to see–not just water, water everywhere. Totally understand — I’m not a sun person either and if I am on a beach, I’m under the umbrella. River cruises are fun because you aren’t cruising for hours on end and the boat stops daily so you can explore. Really cool concept! Taking a Viking down the Rhone in the Fall. Maybe Croisi next Fall for the French touch. I also do not like ocean cruising. I hoe with a patch, I will love the river cruising! Oh excellent, I’m sure that’ll be great. Viking has very nice ships too! You’ll have to let me know how it is after! I would love to do a river cruise and maybe one day I will, this looks like a nice cruise. Love being on the water. Whether a river, lake or ocean count me in. This cruise is something I would love to do. You are right about how everything looks different from the water. You will never appreciate the real beauty of a city or countryside unless you see it by boat. Great post. Looking forward to more! Off and on over the years we have considered doing one of these, or a barge tour, but are always afraid that we will get bored as we are always on the go when we visit France. We don’t usually allow ourselves very much downtime. My parents have recently moved from ocean cruising to river cruising and love it but I fear it’s a bit too staid for me and certainly wouldn’t appeal to my kids. I can see the appeal though and would never say never. 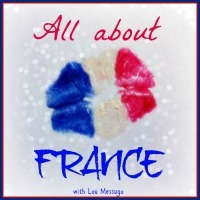 Thanks for linking to #AllAboutFrance and thanks also for taking it on next month. Yes, it’s definitely more of a relaxing, quiet experience and not a wild party and definitely attracts and older crowd. But if you’re looking for that sort of thing, it can be a great way to decompress and see new sights. I’ve been on ocean cruises as well and it’s just a different type of trip. Both have their strong points. And yes, we need to firm up details for AAF next month! Happy to take it on! In July, my mother treated my sisters and me to an amazing trip from Paris to Normandy on Amawaterways. I can’t say enough about what a fantastic time we had. Life onboard was great, as was the food, and all the tours. Can’t wait to go back and take my daughters! Oh fun! That was so nice of your mom! 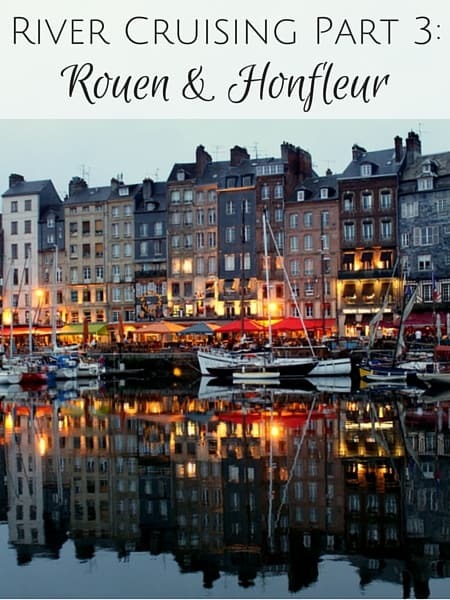 Did you end up in Honfleur at the end? So glad you enjoyed your trip! And river cruising is smooth, so there’s no need to worry about seasickness. Unpack your bags, and relax and enjoy the trip. This is a really wonderful review and I’m going to keep Your experience in mind when I get around to taking Mediterranean cruise. Excellent. This river cruise is fantastic with some beautiful sightseeing’s. Cruising makes it easy to visit several places in a single trip & this river cruising looks fantastic.